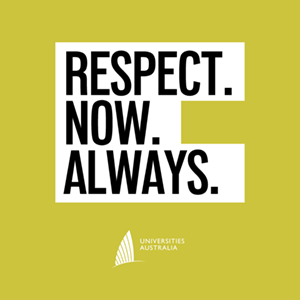 The University of Western Australia strongly supports the nationwide 'Respect. Now. Always.' campaign which highlights the determination of Australia's universities to ensure that our students and staff are safe from sexual assault and sexual harassment. More information can also be found on UWA's 'Respect. Now. Always.' page. For more information on external and on campus advice and support services visit Student Safety. UWA values the input of the many and varied parties in the local, national and international communities in which it exists and recognises that on occasion, it will receive complaints. informative – complaint information is used for the continuous improvement of University operations. For more information on complaint resolution at UWA, select the relevant link below or contact the Complaint Resolution Unit. UWA supports the Universities Australia campaign Respect. Now. Always. The University welcomes students' feedback about their University experience and provides a complaint resolution process designed to address effectively and fairly complaints made by a student about any aspect of that experience. If you, as a staff member, have a complaint about another staff member, a student or the University itself, ensure you follow the proper procedures to have your complaint dealt with. UWA aims to resolve community complaints in a consistent and just manner. If you would like to raise your concerns anonymously, there may be an appropriate process for you to follow.